Small antique porcelain statue of Fukusuke, Japan’s god of merchant prosperity. Fukusuke is one of the lesser known Japanese luck gods, though in the past he was sometimes associated with the famous Shichifukujin seven gods of luck (please read below to learn more). Like Maneki Neko beckoning luck cat statues Fukusuke figures are often spotted at the entrance to Japanese places of business. The god is normally depicted in formal kimono either kneeling or bowing to show his respect and appreciation of business patrons. The old Fukusuke figure offered here is in good condition with no cracks though it does have a few small chips as well as marks and scratches from handling. The statue wears a darkened patina suggestive of age and past display. This statue dates from the mid Japanese Showa period (1926-1989) or before and was acquired in the historic city of Shizuoka, Japan near the foot of Mt. Fuji. Many Shinto items such as ofuda, omamori, hamaya and shimenawa are thought to have limited powers which diminish over time. Japanese people therefore commonly dispose of such items each year in special burning ceremonies called dondoyaki, which are presided over by Shinto priests and performed on the grounds of the shrine. However, many Shinto items are not burned and may find new life as cherished religious items, sometimes with foreigners practicing Shinto outside Japan. Many of the Japanese we have discussed this with (including a Shinto priest) have been pleased to learn that old items of their native faith are often well received by Shinto believers abroad. However, we are sensitive to the fact that some may prefer to see their old Shinto items burned and for this reason we do offer a free disposal service. Anyone who wishes to have their Shinto items properly destroyed in a dondoyaki ceremony may send the items to us which we will hold and take to our local Shinto shrine for sanctioned disposal. Please contact us in advance if you wish to use this complementary service and we will provide you with the appropriate mailing address. Click here to see other Fukusuke items! Ebisu – Ebisu is Japan’s god of fisherman and the morning sun. Ebisu is also sometimes regarded as the protector of small children, a role he shares with the Buddhist deity Jizo. Ebisu is also the only member of the Shichifukujin seven who is of Japanese origin. Daikokuten – Daikoku is the god of wealth, food and worldly success; and statues of this happy deity have for centuries been common fixtures of Japanese homes, particularly kitchens. Daikoku is also reputed to be Ebisu’s father. Fukurokujin – Originating in Chinese Taoism this god is the symbol of wealth, happiness and longevity and is usually seen carrying a long staff or cane. Hoteison – A plump Zen Buddhist monk from China, usually seen with a bag in one hand and a fan in the other. Jurojin – The Taoist god of long life. This god is also usually seen carrying a staff in his hand. Benzaiten – The only female of the bunch. This goddess is from India and is the patron of music and culture. She is usually seen carrying an old fashioned Japanese biwa (a type of lute). Bishamonten – The warrior of the bunch. This god is originally from India and is charged with protecting people and their treasure. Bishamonten is usually depicted wearing armor. Vintage Japanese Shinto Inari fox (kitsune) statues. These porcelain figures are in good condition though each figure does have some small marks and scratches from handling. The figures are also a bit dirty and wear a darkened patina suggestive of age and past display. This statue set dates from the mid to late Japanese Showa period (1926-1989) and was acquired in the historic city of Shizuoka, Japan near the foot of Mt. Fuji. This particular kamidana is located within a very old shop in Shizuoka City, Japan and is flanked on either side by Daruma tumbler dolls. The dolls are the product of the shop where a single family has been making Daruma for over 100 years. The figures are created in the old family workshop where each doll is formed of papier-mache on a hand-carved wooden mold before being moved to an open air courtyard to dry and harden in the sun. The doll is then cut from the mold requiring yet another layer of wet papier-mache to seal the cut. Once more the figure is allowed to dry before being taken into the shop to be hand-painted red and flesh tone with dark black beard and eyebrows and golden body accents. The only area of the doll left unpainted are the eyes in order that the person who buys the Daruma may use the unpainted eyes to help them achieve some important goal. Each doll is cleverly weighted on the bottom allowing Daruma to right himself when tipped. Antique wooden Japanese Shinto kamidana ‘god shelf’ designed for use on ships or boats. This type of small Shinto (native religion of Japan) shrine is commonly used in Japan by families or even organizations and business to symbolically house the group’s patron deity. Kamidana will normally be placed in conspicuous view on a shelf or high wall within an important room such as the family room or in an area where employees or associates work or gather. 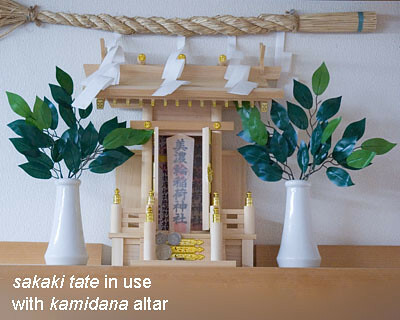 Kamidana are also used to house sacred tablets called ofuda (lit “honorable plaque”) which are inscribed with written prayers and sanctified by a priest. Kamidana are normally not just for show and will commonly receive regular attention from those who live or operate within its sphere of influence. With my wife’s (Japanese) family for instance, the two kamidana within their home do receive offerings twice daily; once in the morning and again in the evening before supper. The ritual is always the same, and anyone who wakes up early enough might enjoy watching mother as she takes the first scoops of rice from the cooker and gives these, along with several clear glasses of water, to her husband who delivers the offerings, along with a solemn prayer, to each of the home’s kamidana as well as to their home’s small Buddhist altar (butsudan). Kamidana (aka zushi) are basically small versions of larger Shinto shrines called Jinja, which are found at the heart of every Japanese community as well as areas of spiritual significance and to mark important natural features such as waterfalls and even the tops of mountains. Please read below to learn more about Japanese Shinto shrines. This unusual kamidana dates from the mid to late Showa period (1926-1989) and was designed specifically for use with ships and boats and features a compact design suitable for installation within the cabin of a marine vessel. The kamidana includes a built-in ofuda which is permanently affixed to the inside of the zushi and which is protected by a decorative screen with braided fabric tassels. The antique wooden kamidana offered here features expert craftsmanship and classic Japanese style, with detailed architectural touches. The shrine includes double doors providing access to a small sanctuary where ofuda and other appropriate religious items may be placed. The kamidana is in very good condition with only small marks and scratches from handling and wears a darkened patina of age. Please refer to the size chart below for links to listings for different sizes and styles of kamidana. And please click here to see blessed ofuda tablets to use with your kamidana! Click here to see sanctified Shinto ofuda tablets! 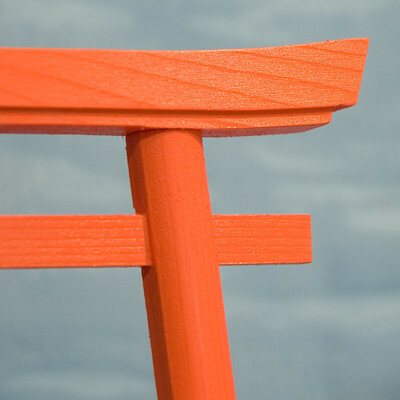 Click here to see additional Shinto items! Click here to see more treasures from Japan! At the heart and spiritual center of every Japanese city, town and village are well preserved wooded plots of land which are the sanctuary of Japan’s native deities. These places, which are called Jinja in Japanese, will invariably include one or more shrines where believers can worship and offer prayers to the gods. Jinja, and the grounds upon which they reside are used not just for worship, but also as a place for community events, festivals and even as playgrounds. 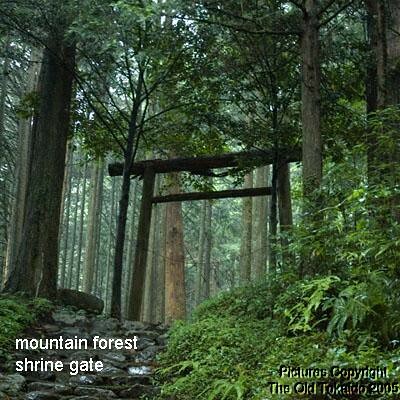 Most shrines typically consist of a large patch of wooded ground with a gate-like structure called a torii providing passage from the secular world into the spiritual. Fierce stone dog statues (one is actually a lion) called komainu stand guard along a stone path leading from the torii to the foot of the shrine complex. Before reaching the shrine, visitors will normally stop to rinse their hands and mouth at a stone water basin (chozubachi) provided for this purpose. This is done as an act of purification before coming into the presence of the resident deity. Upon reaching the actual shrine one must typically then ascent a short staircase to a platform where worship may be performed. Looking through the large structure’s open doors one might spot a second, more secluded building visible beyond the first. This other building is the actual shrine itself and the true residence of the enshrined deity. Legend holds that any who improperly enter the inner-sanctuary will be blinded by the magnificent power residing therein, and for this reason most Japanese are happy to pay their respects from the safety of the doorway of the outermost building. Large Japanese Shinto shrines often have numerous smaller shrines located elsewhere on the shrine grounds. These smaller structures are often only slightly larger than a doll house and are the symbolic homes of lesser deities who are perhaps in some way associated with the god of the main shrine. 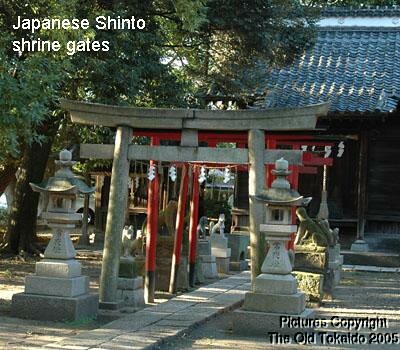 Those who have visited Shinto (native religion of Japan) shrines in Japan may recall passing beneath one or more large gates (mon) at the entrance to the shrine complex. These distinctive structures are called torii in Japanese and are thought to mark the boundary between the secular world and the sanctified grounds of the shrine. In passing beneath a torii one is, in fact, making his or her initial approach towards the inner sanctuary, and accordingly many Japanese will first bow before stepping under the gate. Shinto shrines may include multiple gates, and paths within the shrine may be lined with dozens of closely set torii which together create the effect of a long, enclosed corridor. Believers may use their walk through such passages as an aid in helping to clear their mind of worldly distractions and in preparation for making an appearance before the enshrined deity. Torii gates are traditionally made of wood though it is not uncommon to see gates made of metal, concrete, stone or other durable material. Many wooden torii are unpainted and over time will take on a beautiful weathered appearance much in keeping with the shrine’s natural-looking landscape. Torii are often produced using local timber and therefore shrines which are located in high mountain forests may feature torii constructed simply from a few rough cut conifers. Such torii blend in nicely with the surrounding forest and are emblematic of the Japanese love of nature. Though the torii has become a symbol of Japan as a country it is nevertheless a very unique and important part of the Shinto religious tradition. 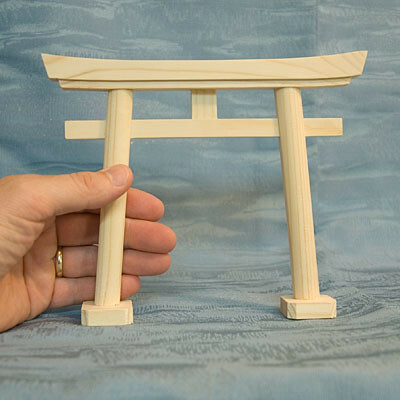 Brand new, small size model Shinto torii wooden shrine gate. Adhesive pads at the base of each of the gate’s pillars allow the torii to be secured in place when on display. This gate is held together through the use of old style wooden pegs and is made of high quality Hinoki Japanese cypress. This is the prime variety of Japanese cypress and has been known and used in Japan since ancient times. Its habitat extends from the mountainous reaches of Fukushima prefecture on the Japanese island of Honshu, south to the island of Shikoku. Hinoki is favored by Japanese craftsmen who appreciate it’s resilience and resistance to cracking, high density and light weight. Hinoki woodcraft are normally left unfinished in order that the fine straight grain and natural whiteness may be appreciated. 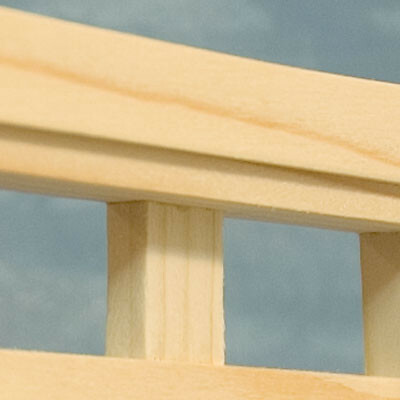 Hinoki has long been the preferred wood for the making of Shinto ceremonial objects. The Shinto religion places great emphasis on purity, and the clean white appearance and pleasant fragrance of freshly planed (Japanese craftsmen rarely use sandpaper) hinoki make it perfect for the manufacture of religious implements. 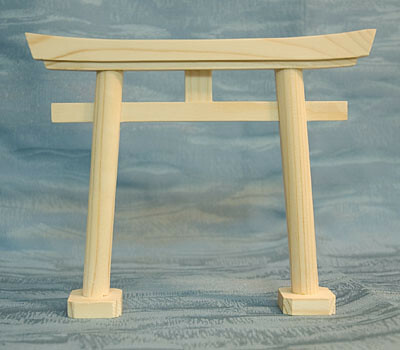 This torii is suitable for use with small kamidana god shelves or in any setting where one might wish to impart the spirit and essence of Japan. 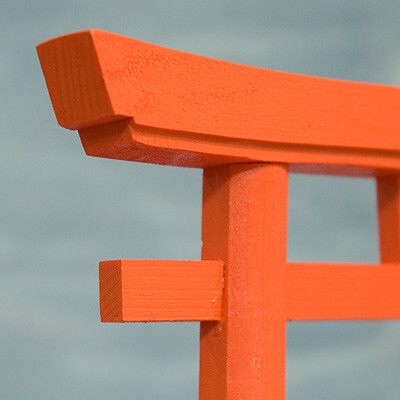 Please click here to see this same torii in red for use with kamidana dedicated to the deity Inari. 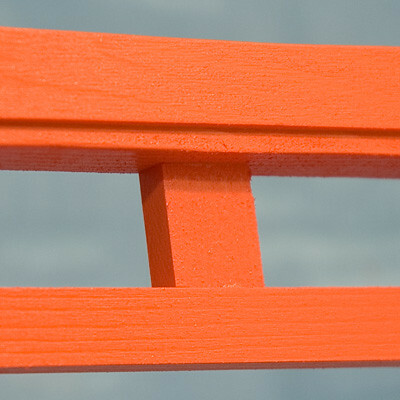 Click here to see more torii gates! Shinto is one of the two major religions of Japan (the other is Buddhism). Shinto is often considered to be the native religion of Japan, and is as old as Japan itself. The name Shinto means “the way of the gods.” Shinto is a pantheistic religion, in which many thousands of major and minor gods are thought to exist. The Japanese have built thousands of shrines (jinja) throughout the country to honor and worship these gods. Some shrines are huge and are devoted to important deities. Other shrines are small and may be easily missed when strolling along roads in the countryside. Shinto gods are called kami. Kami are thought to have influence on human affairs, and for this reason many Japanese make regular pilgrimage to community shrines in order to offer prayers to local kami. The act of prayer involves approaching the shrine structure, passing through the gate-like torii, cleansing the hands and mouth with water and possibly ascending stairs to the main entrance of the shrine. Usually without entering the shrine the worshipper will throw some coins into a stone or wooden collection box and then rattle the suzu bell which is at the top of a long hemp rope. The worshiper grabs hold of the rope and shakes it back and forth causing the copper bell at the top to rattle. This is thought to get the attention of the shrine god. The worshipper then bows twice, claps his or her hands twice and then bows again. In addition, the worshipper may clasp their hands together in silent prayer. Shintoism and Buddhism have managed to find a comfortable coexistence in Japan. Evidence of this harmonious relationship is found in the fact that that most Japanese are married in a Shinto shrine, but buried by a Buddhist priest. 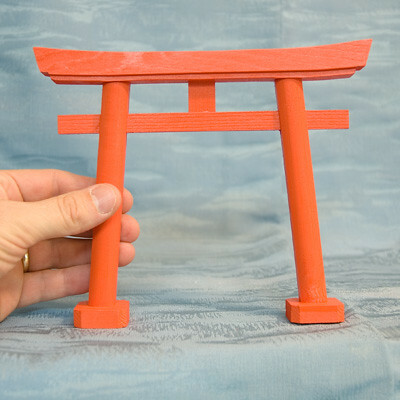 Brand new, small model Shinto Inari-style torii wooden shrine gate. Adhesive pads at the base of each of the gate’s pillars allow the torii to be secured in place when on display. This gate is held together through the use of old style wooden pegs and is made of high quality Hinoki Japanese cypress. This is the prime variety of Japanese cypress and has been known and used in Japan since ancient times. Its habitat extends from the mountainous reaches of Fukushima prefecture on the Japanese island of Honshu, south to the island of Shikoku. Hinoki is favored by Japanese craftsmen who appreciate it’s resilience and resistance to cracking, high density and light weight. 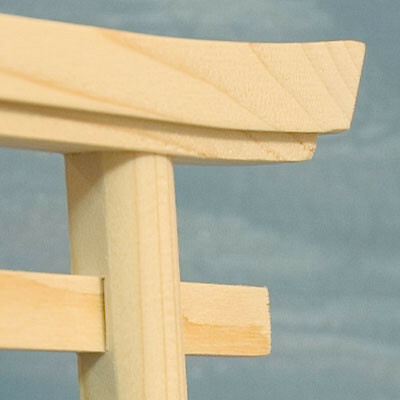 Hinoki has long been the preferred wood for the making of Shinto ceremonial objects. The Shinto religion places great emphasis on purity, and the clean white appearance and pleasant fragrance of freshly planed (Japanese craftsmen rarely use sandpaper) hinoki make it perfect for the manufacture of religious implements. 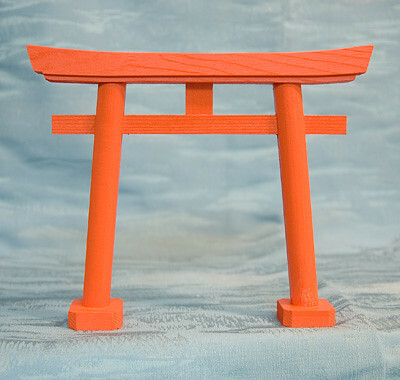 This particular style torii is suitable for use with small kamidana god shelves dedicated to the deity Inari or in any setting where one might wish to impart the spirit and essence of Japan. 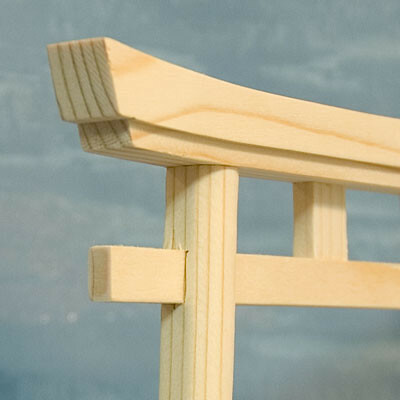 Please read below to learn more about the god Inari and click here to see an unpainted version of this same torii for use with any kamidana shrine. 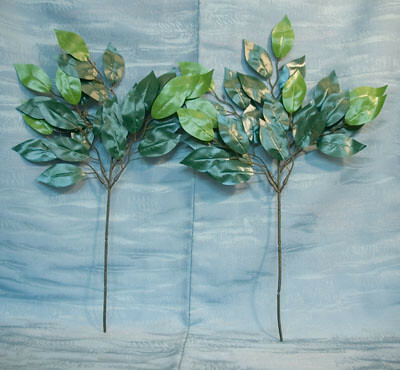 Brand new set of two (2) artificial sakaki branches with plastic evergreen leaves. 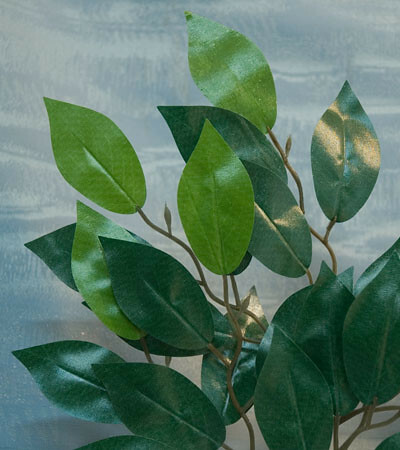 These small, artificial branches with leaves are designed to resemble leaves from the Asian Sakaki tree (Cleyera japonica) which are placed in special vases (not included) called sakaki tate on either side of a kamidana shrine. The foliage from this tree is important within the Shinto tradition as a religious altar display item, as the dark green sakaki leaves are appreciated by the Japanese for their evergreen appearance and hearty nature which are thought to impart a sense of abundance and longevity to the Shinto religious setting. The respect the Japanese hold for this tree is evident in its name as the word sakaki translates as ‘god tree’. 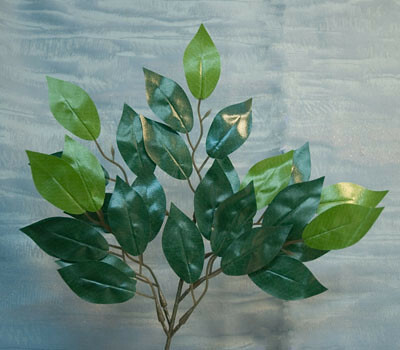 As sakaki trees are difficult to find outside Japan these two small artificial sakaki branches with plastic leaves may be used as appropriate decorative items within any kamidana or other Shinto setting. 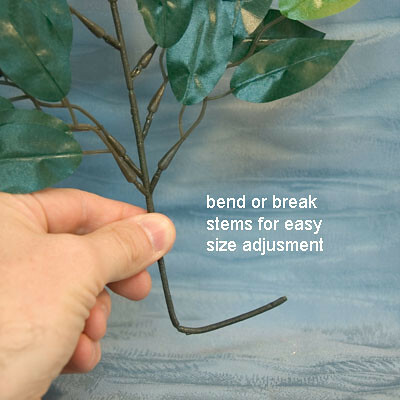 These artificial sakaki are appropriately sized for most common sakaki tate vases though the stems of the plastic sakaki may be bent or broken to adjust the length as needed. Please read below to learn more about Japan’s native religion, Shinto and please click here to see additional sakaki vase sets available within our eBay store The Old Tokaido. Please note that we also carry this item as a complete set with appropriate sakaki tate vases. Please click here to see the complete set listings. 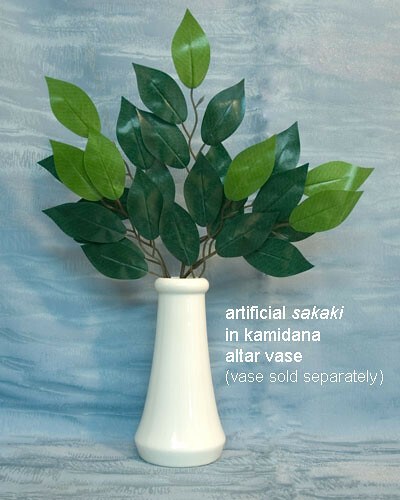 Please note that this artificial sakaki set does not include any vase which must be acquired separately. Please click here to see appropriate vases for Shinto kamidana or complete vase sets which include artificial sakaki. Click here to see more sakaki items! Click here to see other Shinto items! Brand new small size wooden religious collection box or saisenbako as they are called in Japanese. Boxes such as these are found at the entrance of nearly every Buddhist temple or Shinto shrine in Japan. Worshipers commonly approach the altar and throw a few coins into the saisenbako before offering a prayer. The same type of box is used in Japan for both temples and shrines, though worshipers at a shrine may ring a bell before depositing their coins and before praying. One of the images included below shows a very large and old saisenbako found at a shrine near our home here in Japan. The rope hanging before the box is used to ring (rattle really) the bell which is suspended from the rafters (If you look closely you may be able to make out the Shrine’s altar within the gloomy interior). This small saisenbako includes Japanese writing on the front which reads saisen and means ‘offering’. This offering box would be perfect for use with a small religious altar or perhaps as a very unique piggy bank or change tray. To remove coins one need only push down on the smaller wooden slat at the top to enlarge the hole and gain access to the coins. Please read below to learn more about Japan’s native religion Shinto, and how this ancient faith and Buddhism have come to coexist together in modern Japan. Click here to see more Buddhist and Shinto items! Shinto is one of the two major religions of Japan (the other is Buddhism). 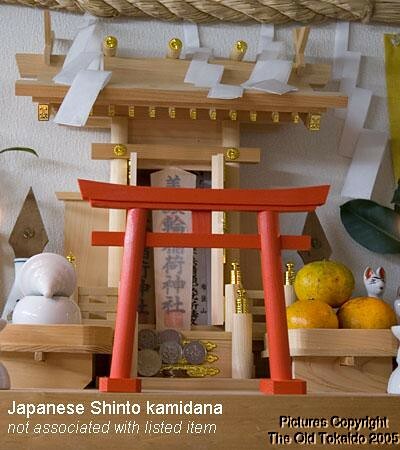 Shinto is often considered to be the native religion of Japan, and is as old as Japan itself. The name Shinto means “the way of the gods.” Shinto is a pantheistic religion, in which many thousands of major and minor gods are thought to exist. The Japanese have built thousands of shrines throughout the country to honor and worship these gods. Some shrines are huge and are devoted to important deities. 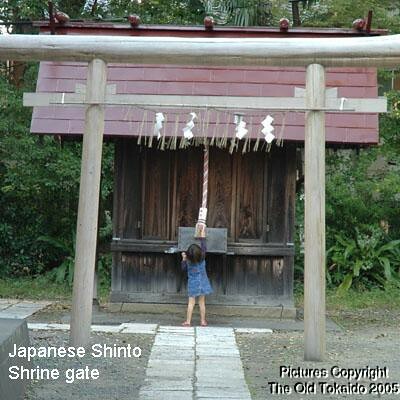 Other shrines are small and may be easily missed when strolling along roads in the countryside (please see the photo below showing our daughter at a very small local shrine near our home in Japan). Shinto gods are called kami. Kami are thought to have influence on human affairs, and for this reason many Japanese make regular pilgrimage to community shrines in order to offer prayers to local kami. The act of prayer involves approaching the shrine structure, passing through the gate-like torii (red gates in the shrine photos below), cleansing the hands and mouth with water and possibly ascending stairs to the main entrance of the shrine. Usually without entering the shrine the worshipper will throw some coins into a stone or wooden collection box and then rattle the suzu bell which is at the top of a long hemp rope. The worshiper grabs hold of the rope and shakes it back and forth causing the copper bell at the top to rattle. This is thought to get the attention of the shrine god. The worshipper then bows twice, claps his or her hands twice and then bows again. In addition, the worshipper may clasp their hands together in silent prayer. Shintoism and Buddhism have managed to find a comfortable coexistence in Japan. Evidence of this harmonious relationship is found in the fact that that most Japanese are married in a Shinto shrine, but buried by a Buddhist priest. 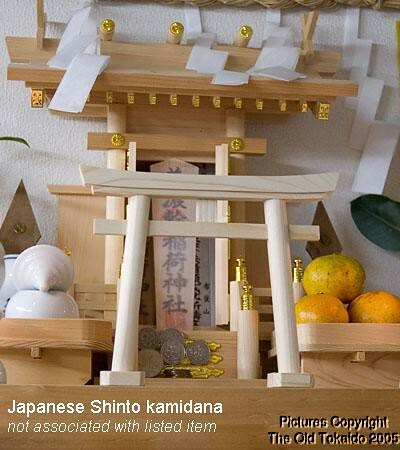 Japanese Shinto (native religion of Japan) religious altar offering vessel. This particular style of vessel is called misuire and is used to hold fresh water. This type of container is a common feature of kamidana household shrines which are the symbolic homes of deities traditionally revered by the Japanese. Altar pieces such as this may be made of wood, metal or ceramic and will occupy the foremost position in front of the kamidana (please see the last photo below which shows a similar ceramic set in use with our office kamidana). Tradition-minded Japanese may change the water in the misuire as often as twice a day at which point they also offer prayers to the resident god. 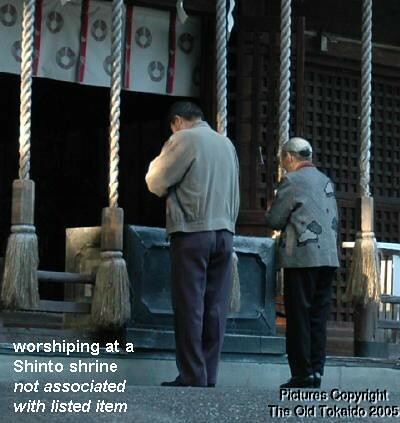 Please read below to learn more about Japan’s native religion, Shinto. This porcelain misuire is very well made and in good condition despite its age though there are scratches and marks as well as some discoloration from age and frequent handling. The vessel dates from the late Japanese Showa period (1926-1989) and was acquired in the beautiful and historic city of Shizuoka, Japan near the foot of Mt. Fuji. Very small set of two glass Shinto religious altar vases called sakaki tate in Japanese. The vases are in poor condition with no cracks though there is a large chip at the lip of one of the vases and both vases have marks and scratches from handling. Both vases wear a darkened patina of age. These special vases are designed specifically for holding small branches displaying leaves from the Asian Sakaki tree (Cleyera japonica) which are placed on either side of a kamidana shrine. The foliage from this tree is important within the Shinto tradition as a religious altar display item, as the dark green sakaki leaves are appreciated by the Japanese for their evergreen appearance and hearty nature which are thought to impart a sense of abundance and longevity to the Shinto religious setting. The respect the Japanese hold for this tree is evident in its name as the word sakaki translates as ‘god tree’. Please read below to learn more about Japan’s native religion, Shinto and please click here to see plastic sakaki as well as additional sakaki vase sets available within our eBay store The Old Tokaido. Please note that this vase set does not include any real or artificial sakaki branches which must be acquired separately. Please click here to see similar vase sets which include artificial sakaki displays.